The Llama's Return to the PC in this shareware game based on the classic C64 Game. The camels have rebelled against their captors the Zzyaxians and are out for revenge! Within the great cave was only silence and darkness. For six millennia nothing had stirred within this giant chamber; but now there came an intrusion of light, of harsh cathode rays, as six hundred high-resolution colour CRTs came flickering to life before the very eyes of the slumbering heads. There was a chattering of furry ears that twitched tentatively as the camels prepared for action. 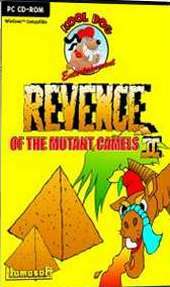 Features: Wacky fun shoot em up; Includes 100 levels; Earn extra credits; Buy extra weapons for your camel; Comical arcade mayhem.